Which kitchen design is best? So you have made the exciting decision to renovate your kitchen, the next big thing to consider is deciding on the right design layout. It’s the layout of the kitchen, not its colour or style that determines how easy it is to cook, eat and socialize in the kitchen. The layout addresses the placement of the appliances, the sink(s), the cabinets, the benchtops, the windows and doors, and furniture such as a kitchen table and chairs. Getting these right will dictate how well your kitchen will function. Form follows function is a principle associated with 20th century modernist architecture which says that the shape a building or object should primarily relate to its intended function. Good things come in small packages when it comes to kitchens. 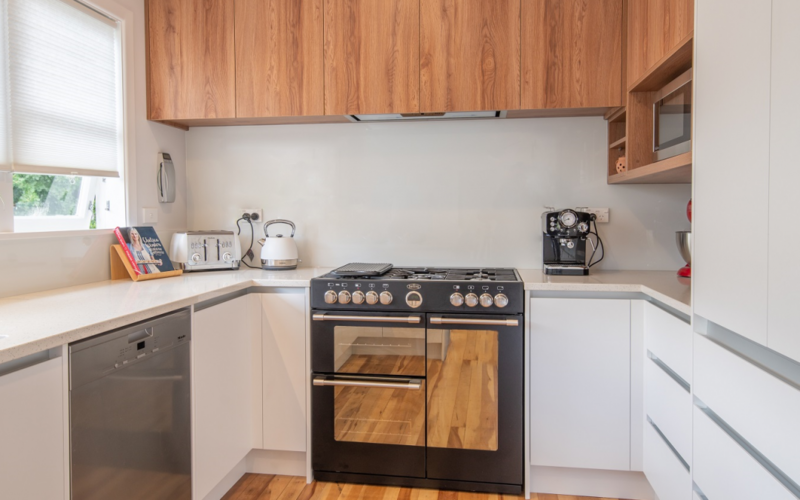 Massive cricket pitch sized kitchens may look beautiful in the glossy magazines, or be something we dream about having one day – but in all honesty, think of the cost of a large kitchen vs the cost of a small one. Not to mention, the cleaning, and the extra paces you need to get from one end to the other, or navigating your way around that huge kitchen island every day. So what makes a small kitchen great? – I guess you have probably heard about the “kitchen triangle”. The idea that you should be able to move freely, with no impediments between the three major work stations – sink, oven/cooktop and the fridge. 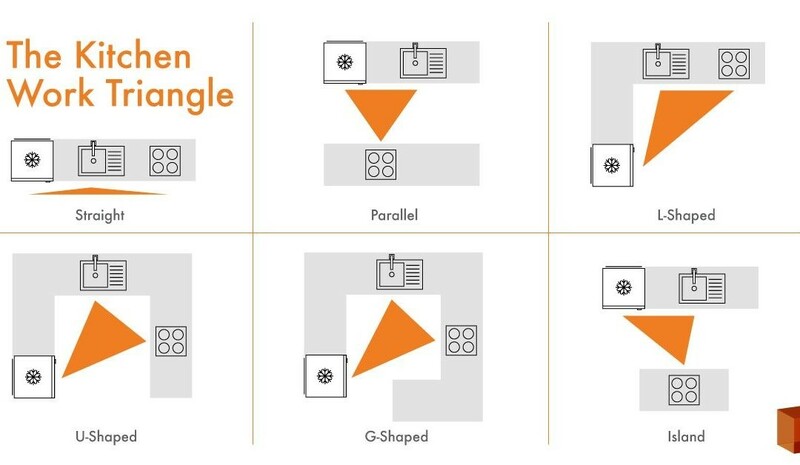 The kitchen triangle will regulate the workflow and make your time in the kitchen so much more functional & enjoyable. You also need to consider the space around the working triangle and between work areas. The distance between walkway aisles, seating clearances, dishwasher placement, and landing areas on your benchtop. Is there space to dump your shopping when your arms are weighted down with as many bags as you can possibly carry so you don’t need to make a second trip to the car! The decision making process can overwhelm the best of us at times. Think about the smaller kitchen – fewer design options in terms of space available means less decisions to make, and this can be a good thing! But what if you have a big house with large open spaces to fill? This can be fabulous if you love entertaining. You can cook, eat, chat, and drink all at the same time without feeling isolated from your guests. That’s got to be a winner in my book! Large families need a hub to hang out in. The kitchen is always the place where your husband or the kids loiter with intent to see what they can pinch while you are preparing dinner, or the dog waits patiently, ever hopeful for whatever’s going! Larger kitchens are truly multi-functional spaces that have pride of place in our homes. A space where we prepare & cook food, eat, watch TV, share the cleaning up (ok that’s a maybe….) catch up with the day’s events, do homework/study, read the paper, or sip a quiet coffee once the kids have gone to school. We do all this in the one space – that’s a pretty remarkable ask don’t you agree? Keeping the services in the same location will narrow down your design options & decisions. Ideal if you want your kitchen to be a social hub. Island kitchens require plenty of room, so make sure your floor plan is big enough to accommodate the seating, and the space required to walk around it. Do you want a sink or cooktop in the island? Consider having these items at one end of the bench rather than in the middle. This will still allow plenty of room to spread the Sunday papers, serve the drinks and nibbles, or plate up the evening meals. These kitchen designs generally feature a narrow passage situated between two parallel walls. Galley kitchens are extremely functional; in fact they were originally used in ships to improve efficiency and most restaurant kitchens are designed in the galley style. A great option if you have a small home and need a compact functional layout. This is a small and efficient kitchen, similar to a galley kitchen but with an extra wall of space, turning the rectangular galley kitchen into a square U-shape kitchen. Do you need an island but don’t have enough space for one? Then the G-Shape kitchen is the perfect solution. This layout adds an additional leg of benchtop space to the U-shape layout. The extra bench space is usually placed at a right angle. Big open plan spaces are popular and as a result so too is the L-shaped kitchen. The kitchen is in the exact shape of an L, with two main walls, one longer than the other, containing the kitchen in its entirety. For instance, the longer wall may contain the refrigerator, sink, dishwasher, and cabinetry, while the shorter leg of the L may contain the stovetop and oven, as well as additional bench space and cabinetry.